"What's that you say, Scotty? You say you need more of it? Well, step right up, for batteries, chargers, and power supplies of all sizes and stripes*. We have the power, so come in and give us some ohm-age. * No striped power supplies are actually available." Compact volt meter, amp meter, and ON/OFF controller for use with Remote Audio power distribution boxes. Rechargeable battery pack for evolution wireless D1 SK Bodypack, SpeechLine Digital Wireless SL Bodypack DW, and AVX SK Bodypack transmitters. For use with SKM 6000/9000 handheld transmitters. For use with the SK 6000/9000 bodypack transmitters. 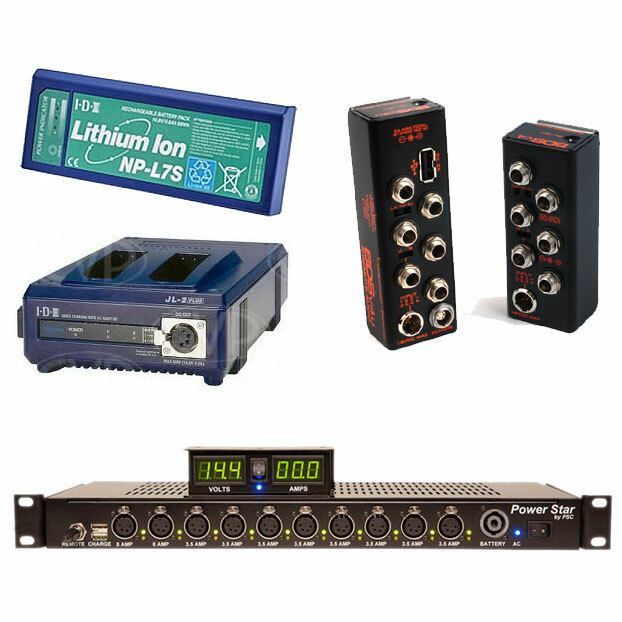 For use with the Shure P3RA, P9RA, PSM1000, UR5, QLX-D, and ULX-D wireless systems. Charges two Sony "L" series batteries, such as those used in Sound Devices, simultaneously. Lithium ion 7.2V, 4600 mAh battery with Sony L-compatible mount. For 7-Series audio recorders.